Lisa Morton joined the Haunted Mansion Writer’s Retreat for the first time in 2012. She is a screenwriter, author of nonfiction books, award-winning prose writer, and Halloween expert whose work was described by the American Library Association’s Readers’ Advisory Guide to Horror as “consistently dark, unsettling, and frightening.” Her short fiction has appeared in dozens of books and magazines, including Danse Macabre, Blood Lite III, The Mammoth Book of Psycho Stories, and Cemetery Dance. In 2010, her first novel, The Castle of Los Angeles, was published to critical acclaim, appearing on numerous “Best of the Year” lists. Her second novel, Malediction, will be released in October 2013. 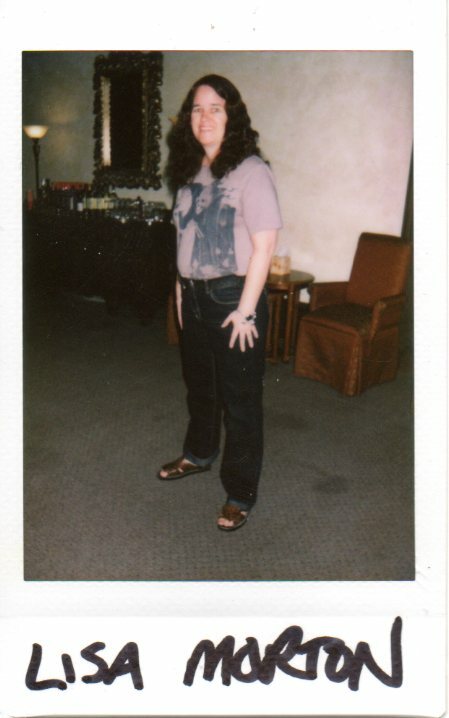 A lifelong Californian, she lives in North Hollywood, and can be found online at www.lisamorton.com. You can also catch her on Facebook at https://www.facebook.com/lisa.morton.165. LM: No. Have things happened to me that were odd or seemingly inexplicable? Yes, as they have to everybody…but I’m a confirmed skeptic and have yet to see any proof of the existence of paranormal or supernatural activities or entities. LM: The only spooky thing that happened to me at the Mansion was being zapped with a horrible flu bug. Otherwise…I’m a fan of architecture, so I was interested in the Mansion and its history for probably somewhat different reasons from everyone else. I found it a tremendously beautiful and peaceful place. Great for writing, in other words! LM: Hearing some of my fellow attendees say they felt as if they’d been touched while they’d been in their beds. I don’t personally believe they experienced anything supernatural…but the fiction side of me started to wonder: If ghosts were real, why would they touch someone? Would they be desperate to make some sort of connection—and would they seek out a living person who is equally desperate? My story “Coming to Day” is about an unhappy trophy wife who has such an experience at (a thinly fictionalized version of) the Mansion, and how the experience changes her. 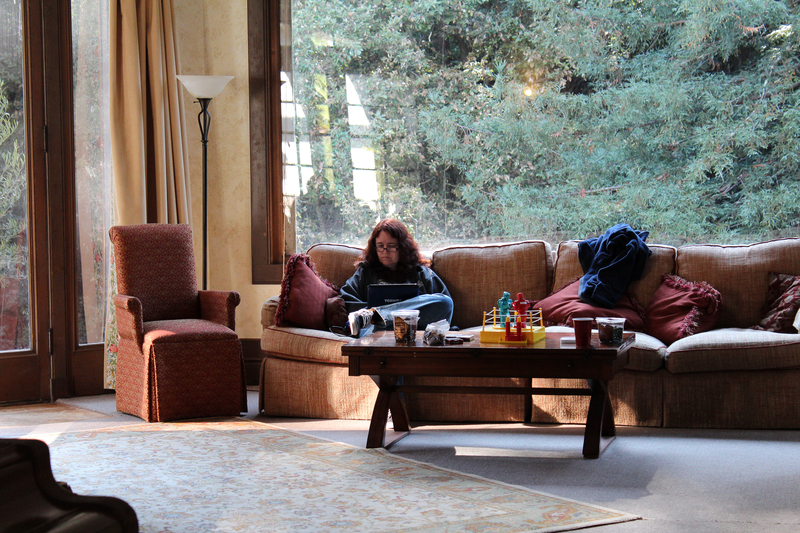 Lisa at work in the Mansion’s common room. Photo by Loren Rhoads. LM: I really want to. Even with a 102-degree fever, I loved my four days at the Mansion! It’d be wonderful to experience it again in a healthy state. LM: I have a ridiculous number of books coming out this fall: two novellas (Smog and Summer’s End, both from JournalStone), the paperback reprint of Trick or Treat: A History of Halloween from Reaktion Books, and my second novel, Malediction, from Evil Jester Press. I’m currently under contract to deliver a tie-in novel to the Stephen Jones-edited Zombie Apocalypse anthology series, and after that I’ll be doing a new nonfiction book for Reaktion Books, which is—no irony intended!—a cultural history of ghosts. This entry was posted in author interview, Blog tour and tagged ghost stories, Haunted Mansion Project, horror writers, Lisa Morton. Bookmark the permalink.